If you love fantasy football or fantasy sports in general, and haven’t yet tried daily fantasy, you are truly missing out. You can play for free, play for money, play against friends, or play against strangers in just about every way imaginable. With the right sports app you can find many daily fantasy sports contest available, choose the one that suits you and compete to win big pay-outs. Luckily for you, we decided to help you and we have one perfect app for this. Let’s see what the app is all about. What is USFantasy Sports all about? 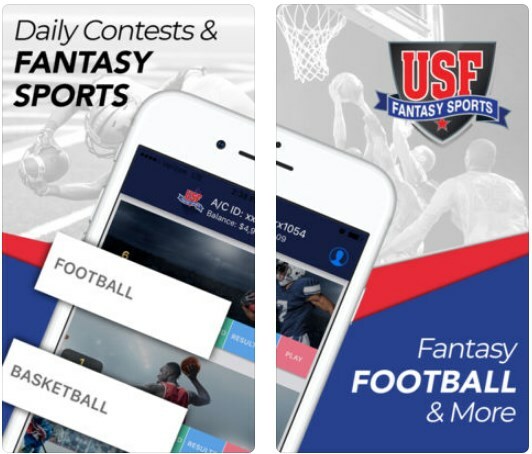 The USFantasy Sports is a cool fantasy sports app that allows its users to simply pick a winner and be a part of contest a get a chance to win big prizes for their entries. On this app developed for IOS users, simple and easy with uncomplicated and inexpensive form of fantasy sports contests, users are able to compete without any salary caps, choose a finer or order of finish and get pay-outs for their exact guesses. With multiple fantasy sports to compete in and multiple formats in a field of consisting of 8 to 14 athletes, users will enjoy competing and winning big pay-outs. On this app, all users are offered very helpful features that are allowing them to use simple scoring rules and simple contest formats to win big without any effort, easily. If the user wants he can enter just small fees and his returns can be 10X or even bigger every time he competes. On the app users are offered various ways to play and various fantasy sports to compete in and they need to simply pick contest and choose their contest entry. For players that like to play for larger prizes they can choose the EXACT 2 or EXACT 3 and pick two contest finishers in order or top three finishers in order. For users that want to go even deeper and win even bigger, they play PICK 2 or PICK 3 to pick winners of various contests. Users don’t need to spend a lot of money to win their entries can go as low as 10 cents. The pay-outs are based on the final prize values. The app is offered also like an android apk version and can be found on the app’s official website. Download it for free now on App Store and enjoy your fantasy sports payouts!